At the April 2009 meeting of the American Physical Society (APS), Caltech astronomer Dr. Richard Ellis will deliver the keynote address, which will chart the 400-year history of the ground-based telescope and the quest for bigger, more powerful tools for astronomy. His talk is one component of a range of international activities held as part of the 2009 International Year of Astronomy. In 1609, Galileo used his modest telescope to discover the moons of Jupiter, study the phases of Venus, and observe the irregular mountains and craters of the Moon. These observations were instrumental in confirming the Copernican view of the solar system – that the Earth orbits the Sun rather than the reverse as contained in the Ptolemaic model. This provided the impetus for countless others to follow and make their own discoveries, often designing large telescopes in an attempt to see further into space. Ellis will present how these early discoveries launched the science of modern astronomy. His talk will provide a veritable “who’s who” in the history of astronomy by reviewing landmark discoveries: the true nature of spiral nebulae as external galaxies, the expansion of the Universe, the discovery of energetic quasars fuelled by material falling toward a black hole, and the study of absorption lines in their spectra as probes of primitive gas clouds between galaxies. Going hand-in-hand with these discoveries has been the evolution of telescope design. Early refractors with lenses of increasing size and weight were replaced by reflectors with large primary mirrors. A turning point was the remarkable casting of the Pyrex 200-inch mirror. But, toward the end of the 20 th century, a new generation of large telescopes based on a segmented primary mirror design emerged. This innovative design removed many of the earlier constraints on telescope size and power. With the further success of adaptive optics, a remarkably powerful technique for correcting for atmospheric blurring of celestial images, ground-based telescopes can now achieve a better resolution than the Hubble Space Telescope. Today, leading observatories are exploiting the power of adaptive optics and other technologies such as charge coupled device (CCD) cameras, infrared array detectors, and multiple-object spectrographs to improve our understanding of the large-scale nature of the Universe and details of the many varied sources within it. However, what has also emerged is an understanding that even with these advanced technologies, today’s large telescopes still lack the power and resolution necessary to study the most distant objects and how they evolve, and to examine extrasolar planets in the necessary detail to see if life forms can be supported. To continue the journey of discovery, teams around the globe are working to build the next generation of giant optical and infrared telescopes. The first of these future observatories will most likely be the Thirty Meter Telescope (TMT). With its 492-segment primary mirror and integrated adaptive optics systems, TMT will be able to observe objects nine times fainter than existing 10-meter telescopes and with twelve times better resolution than the Hubble Space Telescope. “There are many very exciting projects that will herald the next generation of astronomical observatories,” said Ellis. “Each of these has a vital role to fill in advancing science in the coming decade and beyond. 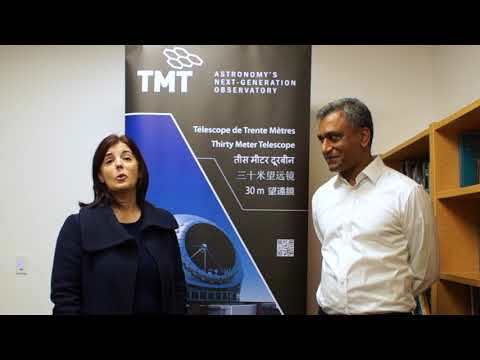 TMT will certainly stand out when it achieves ‘first light’ in 2018 as the world’s most advanced and capable ground-based telescope." The TMT project is a partnership among the California Institute of Technology, the University of California, and ACURA, an organization of Canadian universities. The Gordon and Betty Moore Foundation provided $50 million for the design phase of the project and pledged an additional $200 million for the construction of the telescope. ACURA committed an additional $17.5 million for the design and development of TMT. The National Astronomical Observatory of Japan has also joined TMT as a Collaborating Institution. Support has also been provided by the U.S. National Science Foundation.